Some cities or towns like to self-apply “XYZ Capital of the World” titles a little too liberally. Like, is Corsicana, Texas really the “Fruit Cake Capital of the World”? I guess that depends on the people who live there. But Morton, Illinois lays claim to its title by rights. The Nestle/Libby canning plant in Morton produces 82% of the canned pumpkin in the world. Now THAT’S a LOT of pumpkin. The town also hosts an annual pumpkin festival that would make any die-hard pumpkin fan lose her orange-tinted mind. Pumpkin bingo, a pumpkin parade, the “Pumpkin Classic” 10k, and a “Pumpkin Idol” sing-off are just a few of the events. 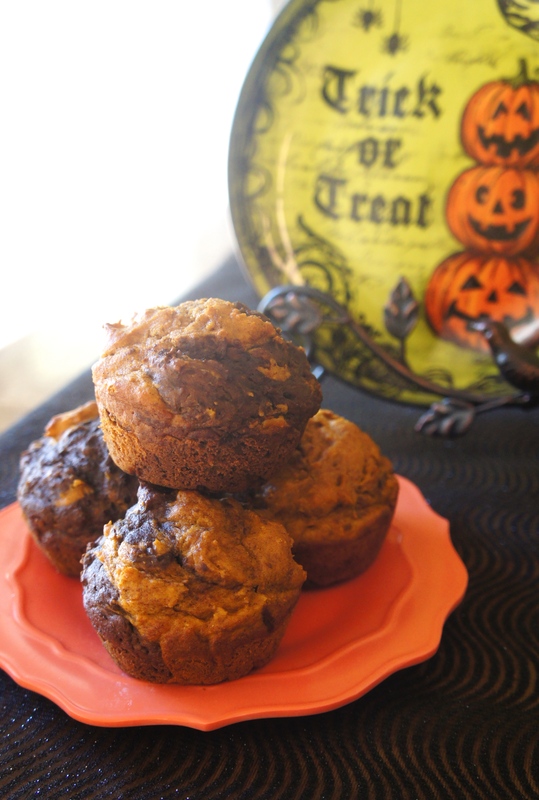 So since I’m visiting the legit Pumpkin Capital of the World tomorrow, I think I have earned the right to share these pumpkin chocolate swirl muffins today. 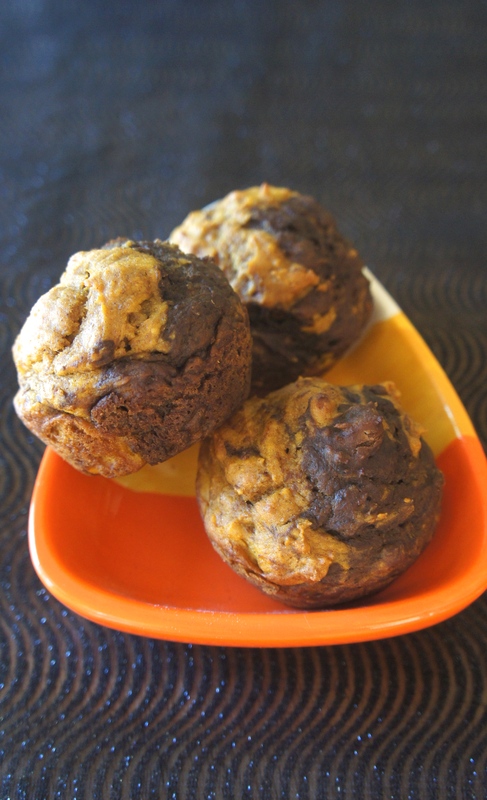 As you can probably tell by their name, these little breakfast treats are a yummy blend of hearty pumpkin and sweet chocolate. To me, there’s also something irresistible about the visual appeal of any swirled baked good, and these are no exception. Every bite yields a slightly different amount of pumpkin and chocolate. In fact, they kind of remind me of the old “box of chocolates” line from Forrest Gump. 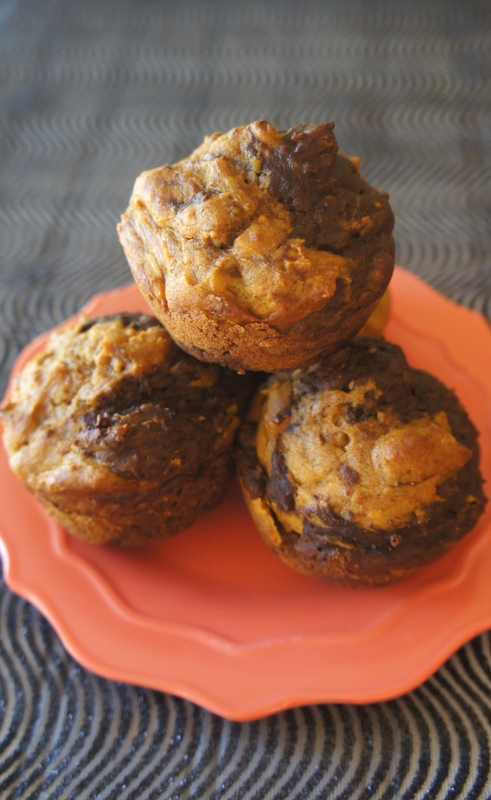 Life is like Pumpkin Chocolate Swirl Muffins-you never know what you’re gonna get. Life is also just a little bit better with fresh-from-the-oven muffins on a fall morning. So grab a mixing bowl (or two–this is one of the few muffin recipes I’m willing to use two bowls for) and give these a whirl–or a swirl, I should say. They would make a fun addition to a fall brunch, or a fitting breakfast for Halloween morning. And just remember, if you make them with canned pumpkin, there’s an 82% chance it came from Morton, Illinois. Preheat oven to 400 degrees. Spray 12 muffin cups with cooking spray. In a large bowl, mix butter and yogurt with an electric mixer until thoroughly combined. Mix in sugars and beat until fluffy. Add vanilla, pumpkin, and eggs and mix until well combined. Make a well in the center of the batter. Pour in flour, baking powder, salt, and baking soda and mix until just combined. Divide the batter equally into two bowls. Into one bowl add cinnamon, nutmeg, and allspice and gently mix. In the other, add milk and cocoa powder and gently mix. 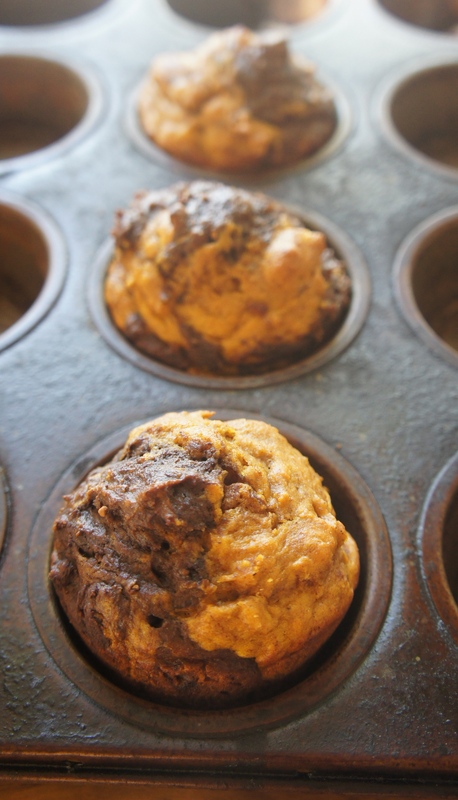 Fill muffin cups with half chocolate batter and half pumpkin batter to about 2/3 full. Use a knife or toothpick to swirl batters together to your liking. Bake in preheated oven 15-17 minutes, or until a tester inserted in the center comes out clean.